Members of St. John’s and St. Michael’s will come together on Sunday November 30th, beginning at 4pm for an Advent Wreath-making workshop and potluck supper. Supplies will be provided so that each individual or family can make and bring home an Advent wreath for family devotions. A simple prayer service for use will be available. We will follow our workshop with a potluck supper. Please join us in the St. Michael’s Parish Hall. Rev. Fran will lead an Advent Quiet Day at St. John’s on Saturday December 13th, beginning at 9am. More details to follow. We will gather together for Bible Study, looking at the lectionary readings appointed for the following Sunday. 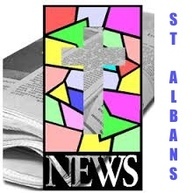 Our first meeting is on Monday Dec. 1st at St. Alban’s – in the parish hall.